Description: This Shivastalam is said to be one of 24 shrines special to Dakshinamurthy and is surrounded by Manniyaru, Kollidam and the Kaveri. This shrine has been mentioned in Tiruvacakam, Pattinathar's work and in the Tiruvilayadal Puranam. Tiruppurampayam is also known as Tiruppirampiyam. It is considered to be the 46th in the series of Tevara Stalams in the Chola kingdom located north of the river Kaveri and is located near Innambar near Tiruvaiyaru. Legend has it that since the shrine stayed unaffected by a great deluge, the name Purampayam came into being. (Puram-outside). Bhrama is said to have worshipped Shiva here. It is believed that this shrine survived the great deluge, and the Vinayakar is referred to as Pralaya Kaala Vinayakar. It is belived that Sambandar caused miracles to happen at this shrine. Shiva is believed to have manifested himself as a witness to save a helpless devotee, hence the name Saksheeswarar. A certain King of Magadha Desam was cured of the 'Muyalaka' disease at this shrine. Shiva is said to have revealed the eternal truth to Sanakar and the other munis under the banyan tree on the banks of the Bhrama Theertham, facing South (Dakshinamurthy). 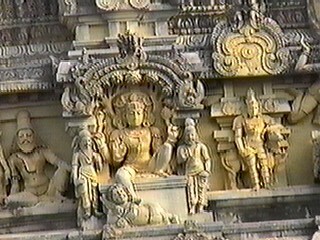 (The image above is that of a stucco image of Dakshinamurthy from Tondai Naadu). The Temple: The Amman shrine is housed in the 2nd Prakaram while Shiva's sanctum is reached past the Mahamandapam housing all the relevant Parivara Devatas. Dakshinamurthy's shrine is located on the southern bank of the temple tank. There is also a shrine to Sattanathar here. Most of the inscriptions here here go back to the days of the Imperial Cholas (Parantaka I & descendants), detailing the grants that were made to the temple. There are inscriptions also from the Raja Raja's and the Vijayanagar period. This temple is under the adminstration of the Madurai Gnanasambandaswamigal Aadeenam. Festivals: 4 worship services.The annual Bhrammotsavam is celebrated in the Tamil month of Maasi and the annual Vinayakar festival is observed in the Tamil month of Avani. Kartikai Deepam ,Arudra Darisanam, Vishu,Aadipooram, Navaratri, Skanda Sashti and Taippoosam are celebrated here.